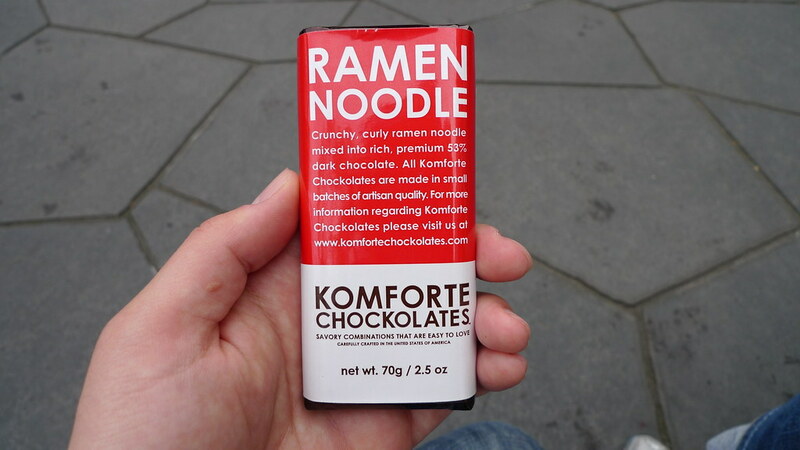 Komforte Chockolates - Ramen Noodle. The other day, I came across an article talking about a chocolate bar filled with dry ramen pieces. I immediately perked up and researched where I could purchase this unique item. Thankfully, it was available at one of my local Asian grocery stores, Uwajimaya. Without hesitation, I bought it and sampled it right away. Continue reading to see if the ramen chocolate bar is good or not. 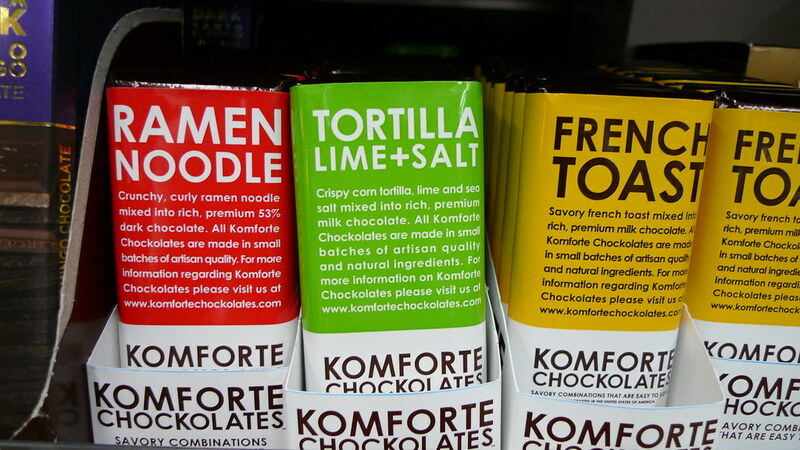 Komforte Chockolates makes three very distinct chocolate bars: Tortilla Lime + Salt, French Toast, and Ramen Noodle. They are made in Orange, California and go into simple and attractive colored wrappers. The Ramen Noodle wrapper says "Crunchy, curly ramen noodle mixed into rich, premium 53% dark chocolate." Holding up the Ramen Noodle bar. The chocolate bar is pretty basic and the description on the wrapper sort of says it all. The chocolate is great quality. It's not too bitter like I find most dark chocolates. The dried noodle pieces are where it's at. I think most of us have tried a small piece of dry ramen before cooking it (I know people who used to crush up Top Ramen and sprinkle the seasonings in the bag and eat it dry.). 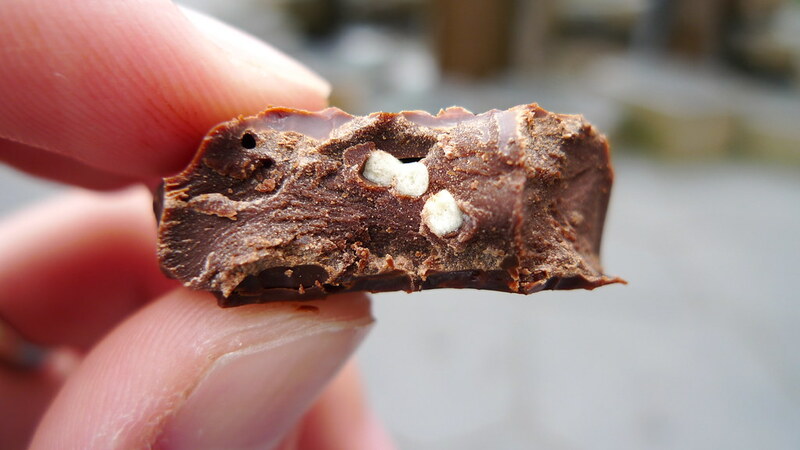 The ramen in the chocolate bar is crunchy and just little salty. Not too far off from a Nestlé Crunch bar. It's actually a very pleasurable combination. 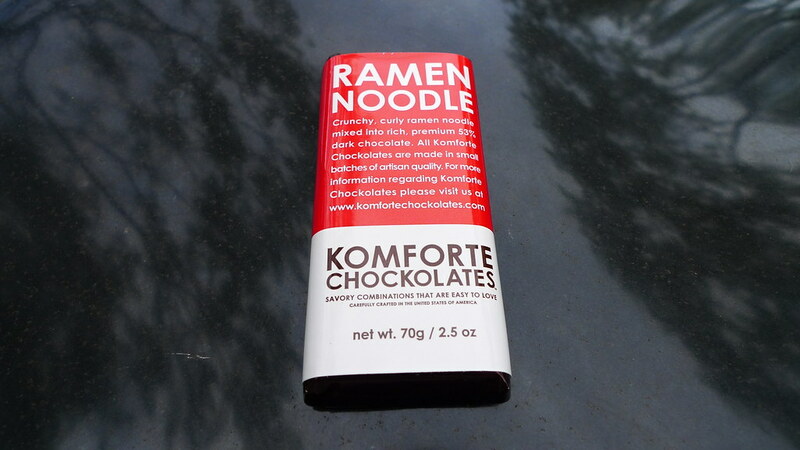 A bite into Komforte Chockolates' Ramen Noodle chocolate bar. My only complaint is that there is not enough noodle pieces in it. I'm not sure why Komforte Chockolates felt the need to skimp out a little, but it really is the only thing preventing me from giving this noodle item a perfect score. I highly recommend trying it and sharing it with some brave friends. It's a bit hard to find, but can be ordered online through The Meadow. All three chocolate bars that Komforte Chockolates makes. Side review: I also tried the Tortilla Lime + Salt and French Toast flavors. The Tortilla Lime + Salt is bold. My gosh! The lime is great, but the salt is way too overpowering. The crunch of the tortilla chip was good though. The French Toast tasted vaguely like the real thing. It reminded me of General Mills' Cinnamon Toast Crunch spin-off, French Toast Crunch. It was better than the tortilla one, but not by much. Thank you for the kind and fair review of our Ramen Bar! We are looking into making a few changes to that one like adding in some of the savory taste that would be part of the flavor packs (will have to find a natural set of spices as the original ones have too many man- made things in them).